The bicycle is in newer condition. 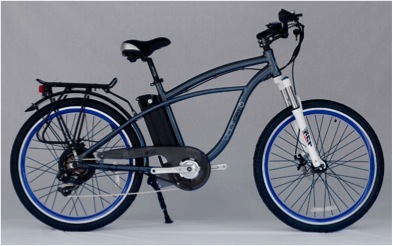 It is only 3 months old It is an electrical bicycle with a rear hub motor. The color is mainly white with blue markings. The brand of the bike is clearly indicated on the frame "Volton". Attached picture will show an illustration of the exact bicycle. It is very unique as I am told by the owner of the company that he has only sold 1 in Chicago and that is mine back in August. It was parked directly in front of the IIT Kent Law School on W. Adams Street downtown. This is a high-traffic area which made it unusual that thieves are so brazen to steal it in broad daylight. There are always plenty of bikes parked there, however thinking back, mine had the weakest lock. The bicycle was also probably targeted as it is an electric bike. However, the battery and charging system was in with me in my office at the time of theft. On 12/1/2013 the victim wrote to say that he had recovered the bike from a S side flea market. A good samaritan spotted it there and called the owner and told him where to find it. The owner brought ownership materials and the battery. Police were called and responded with 2 units. The victim did not mention whether a police report had ever been filed.